The exhibition ‘Remember Them’ brings together a group of international artists - Brian Maguire, Julián Cardona, Lise Bjørne Linnert and Teresa Margolles - to highlight the issue of femicide on the Mexico-USA border. Julián Cardona (Mexico) is a photographer and journalist living and working in Ciudad Juárez. ‘Remember Them’ includes a selection from his photographic series ‘The Truth’. The images show families of the victims searching for bodies in the desert, arguing with authorities and burying their dead. Brian Maguire (Republic of Ireland) has visited Ciudad Juárez several times since 2009. 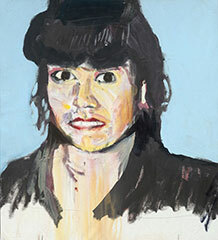 Working with the families of victims, he has created a series of portraits of young women who have disappeared or who are known to have been murdered. Based on interactions with the families and on photographs the portraits “.. show the singular, vital personality that has been taken.” Maguire always paints a second portrait which remains with the family in Mexico. A short text forms part of the work and provides details of the person’s life and death. Norwegian artist Lise Bjørne Linnert presents Desconocida Unknown Ukjent, an international participatory art project which has involved the collaboration of thousands of individuals since 2006. The embroidered names that make up this delicate wall are some of the women who have been murdered or gone missing in Ciudad Juárez since 1993. The exhibition includes an opportunity to manufacture further tags which can be included in future displays. Teresa Margolles (Mexico) will show, for the first time in the United Kingdom, her film work Irrigación. Commissioned by Ballroom, Marfa, Texas, it shows a truck as it dispenses 5000 gallons of water mixed with blood and other bodily matter on the road between Alpine and Marfa, Texas, USA. Margolles collected the body fluid from multiple sites of violence in Ciudad Juárez. Teresa Margolles is Mexico’s leading contemporary artist. Now based in Spain, in 2013 she won the Artes Mundi prize. The 5th E. Allison Peers Symposium 'Remember Them: Artistic and academic responses to femicide in Ciudad Juárez, Mexico' will be held at the Victoria Gallery and Museum on Friday 27th September. This event is free but booking is required.